On Monday Oct 5, 2015, Dr. Alan Stern, the head of NASA’s New Horizons Pluto probe did a talk at the University of Alberta. It was enormously well attended and well received. Here are some of my notes from the presentation, in point form. · Dr. Stern has a PhD in astrophysics and planetary science. He has Masters degrees in aerospace engineering and planetary atmospheres. Plus, of course, a B.Sc..
· He is also involved in some private space ventures, including Golden Spike, which is a private venture with the ambition of returning to the moon. · Since boyhood, he always wanted to do space science. o Done scientific work at the south pole. o Flew high performance jets for high altitude research. o Been involved in 26 space missions (including the shuttle). o Been involved in many planetary missions. o Still considers the Pluto mission to be the one that stands out the most. · The New Horizons Pluto fly-by came 50 years to the day after the first Mariner fly-by of Mars. · Pluto, of course is the last planet to be visited, while Mars was the first. 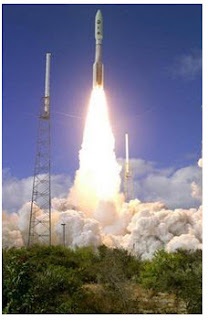 · There has been a widespread desire for a NASA mission to visit Pluto for decades, at least since the 1990’s. Funding has always been an issue, of course. 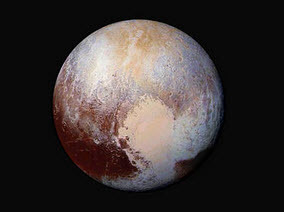 · Even without good photos of Pluto (the best one until New Horizons was from Hubble, and it showed only a small number of pixels), there was general agreement that Pluto would be a very interesting object. · As more was learned about the Kuiper Belt (Dr. Stern used the pronunciation “Kwipper”), it was realized that Pluto was the prime example of a whole new class of Kuiper Belt objects, rather than an oddball “midget” planet, far off in isolation in the distant reaches of the solar system. · Gerard Kuiper, in 1951, had theorized that there should be a zone in the outer solar system from whence many comets originated. · In 1988 a team of Canadian researchers (Duncan, Quinn, Tremaine) established conclusively that there must be a Trans-Neptunian belt, where short-period comets originated. · Kuiper Belt objects then began to be discovered – 1 in 1992, 4 by 1993, 10 by 1194, over 1500 now. · In fact, it is now considered likely that there are more Pluto sized planets than “regular” planets, as well as billions of comets and hundreds of thousands of “planetoids”. · All of this gave impetus to a Pluto mission, now that it was realized that it could teach us much about this new aspect of our solar system. · Many programs were advanced, but New Horizons was finally given the green light in 2003. · The spacecraft had to be designed an launched within 50 months of getting the go-ahead, in order to catch the launch window that would allow the Jupiter fly-by gravity assist. The timelines were tight, but they did it (obviously). · They also did it within budget, or at least pretty nearly so. Note that their budget was only 20% of that allowed for the Voyager mission. 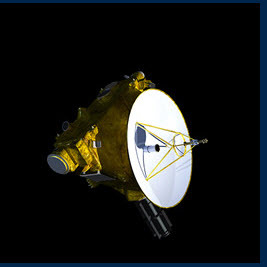 · The New Horizons spacecraft only weighs about 1000 pounds or 450 kilograms. That’s about the size of a baby grand piano. Voyager was much bigger. · Its plutonium powered generator put out about 250 watts at launch (that’s about the same as a solar panel on my garage). It’s now down to about 200 watts. · By the 2030’s, the power will probably have decayed to a level that is too low to maintain communications with Earth. · Its instrumentation is small, but has a lot more “firepower” than Voyager’s did, due to advances in computer science, miniaturization, etc. That’s one reason that so much can be done with only 200 or so watts of electricity. · There are seven science instruments in all, including cameras, spectrometers, telescopes, dust counters, and plasma instruments. · As an example of technological change, a spectrometer on Voyager had 1 pixel. A similar instrument on New Horizons has 64,000 pixels. · In January 2006, the spacecraft was launched with an Atlas 5 rocket, the largest currently available (over 70 meters in height). It has 5 rocket motors, each about 25 meters long. · The rocket that propelled New Horizons out of Earth orbit gave it a 14 gee kick (an acceleration of about 140 meters per second per second). · It took 9 hours to cover the Earth-moon distance, Apollo took several days. · This made it the fastest launch speed ever. · After that, it got a further speed-up, via a gravitational assist from a Jupiter fly-by, in Feb 2007. The spacecraft steals a little bit of Jupiter’s angular momentum, and gets accelerated in the process. · Some good science was done during the Jupiter fly-by. This also allowed testing of various spacecraft instruments, navigation and so forth. · Then, the spacecraft hibernated for 8 years. Mission personnel used this hiatus to do extensive planning and scenario testing. · In January of this year, New Horizons was awakened. · Some mid-course corrections were done, star field photos were taken for navigation, etc. · By April, the images of Pluto and Charon began to exceed those that Hubble had taken. · The fly-by, of course, occurred on July 14 (my wife’s birthday). · The fly-by was fast, a matter of hours at closest approach. So, a lot of science was done in a short time, which required a lot of computer memory. The need to pivot the ship as it passed Pluto-Charon made it temporarily out of contact, so that also necessitated storing a lot of data. · Thus far, only about 10% of the data has been transmitted to Earth. · New data comes in daily, via the deep space tracking network. So, new things are constantly being discovered. Multiple experts pour over the data, from geophysicists, to particle scientists, to astrophysicists, to … well, lots of different specialties. · Spoiler alert: Dr. Stern hinted that a big discover was in the pipeline for later this week. o Charon (big moon): 1200 km. o Nix (little moon): 50km. o Hydra (little moon): 50km. · Nix and Hydra are cratered, very bright (ice? ), not round (too small). o Has a world spanning canyon. o The north pole is dark (tholins, a sort of nitrogen?). o Some craters have dark ejecta, some light. o Charon has a complex geology. o Note that NASA has a 64 meg photo that you can download. This has surface detail down to 100 meters in size. o “The Heart” (Tombaugh Reggio) is the biggest and brightest feature. 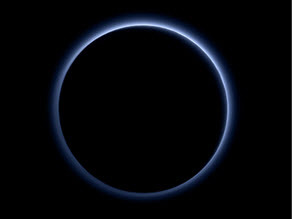 o Pluto has an unexpectedly hazy, high atmosphere, which could be seen well in the photos taken after the fly-by, back towards the sun. o Mountains are present, which was something of a surprise. They show that the layer of nitrogen ice must be quite thin (nitrogen ice won’t support much weight, so if the nitrogen layer was thick there would be very subdued surface relief). o At minus 200 Celsius, water ice is hard as steel. It could “build mountains”. The nitrogen ice is just a frosting on the water ice. o The surface features dendritic patterns (like river valley systems on Earth). So, some fluid must have flowed in the past, when the atmosphere was thicker. o Some ice fields feature “ovoids”, which would indicate convection cells in the ice (something like bubbles in porridge, but happening on a glacial time scale). So, there must still be a heat source under the surface, contrary to what theory had predicted. o Sputnik Planum has no craters, indicating that the surface has been “re-done” in the recent (by geologic scales) past. Again, this indicates that there must be a heat source. o As Dr. Stern put it, “Pluto’s engine is still running”. o There are other geological features (some huge) that were not expected. The same is true for Charon. o Some parts of Pluto and Charon are similarly coloured, a sort of red. Is the same process at work? Have they exchanged matter somehow? o Pluto may have a subsurface ocean. Data that may help establish whether or not that is the case has not been downloaded yet (but what about Thursday? Much speculation about that announcement in the audience. Could it be the water announcement?). o If so, there is always a chance of life. o The heat source is perhaps the biggest surprise. Nobody has come up with an explanation. o The mutual gravitation of Pluto and Charon shouldn’t be responsible, since they are now tidally locked (though “a lot of smart people” have tried to make that work). o Later note regarding the Thursday announcment: Pluto’s sky is blue and there is water ice on the surface. · A huge media response, as we know. · People love exploration, especially the idea of “first contact” with an entirely new planet. · Perhaps this will create political pressure for another mission to the Kuiper Belt (or beyond). 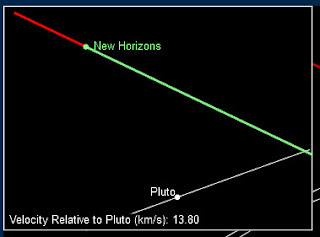 · New Horizons is on its way to a small (about 50 km) Kuiper Belt body. · It is expected that it will make a close approach on Jan 1, 2019. · The spacecraft will eventually leave the solar system. · It should be healthy until the 2030’s at least, based on the decay time of the plutonium in its electrical generator. So, we should be getting feedback about the outer solar system for decades. · There are many other fascinating Kuiper Belt Objects which ought to be explored. No doubt they would hold surprises for us.